UDM Downloads > Time-Assistant Free - web based timesheet software - professional time tracking solution for Intranet! 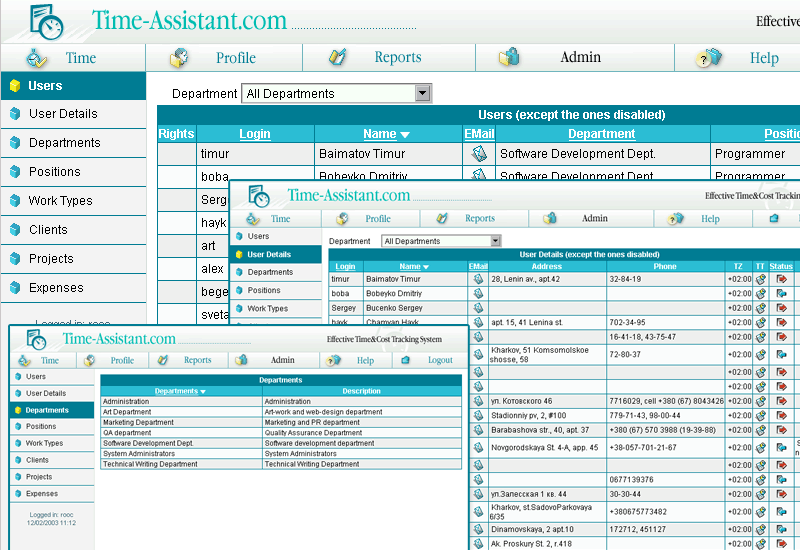 Free web based timesheet software featuring employee time tracking and expenses for Internet and PDA. It is a daily time tracking solution designed to reduce the drudgery of recording, analyzing and reporting associated with everyday working routine. With Time-Assistant you can easily manage employee timesheets and expenses, calculate salaries, prepare project estimates, get invoices based on personal or client work rates. Time-Assistant may be used by: employees, who need to carefully track their time spent on certain tasks, projects and work-types; department/project leaders who need to have a tracking tool and accurate and well-timed reports on the time and money spent while doing different tasks and projects; managers, who require structured information to optimize staff management, increase productivity and cope with rates/salaries; time-based consultants like IT specialists, accountants, lawyers, etc, who need a convenient tool to track time accurately. Time-Assistant is accessed using a browser and requires no client installation. It includes all the standard timesheet and hourly rate entry functions, project tracking abilities as well as automatic salary calculation and comprehensive time & cost reporting.